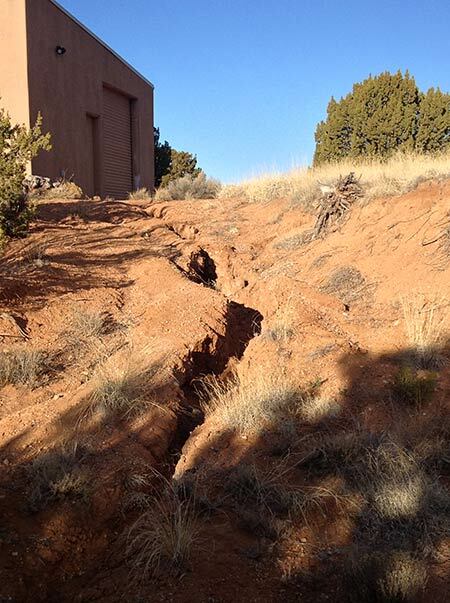 Unchecked erosion can jeopardize adjacent structures, slowly decrease usable space, bring down property values and create dangerous flooding patterns. 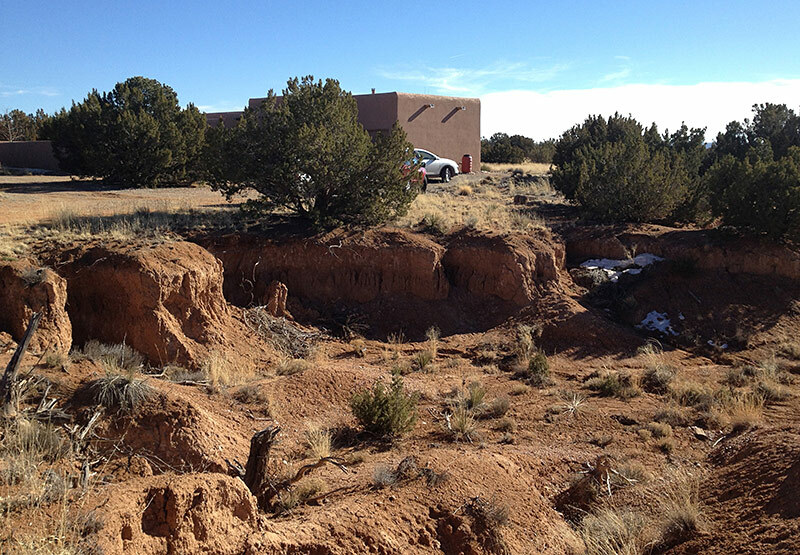 Although erosion is a natural process, the fragile soils in our high desert are very susceptible to major erosion. 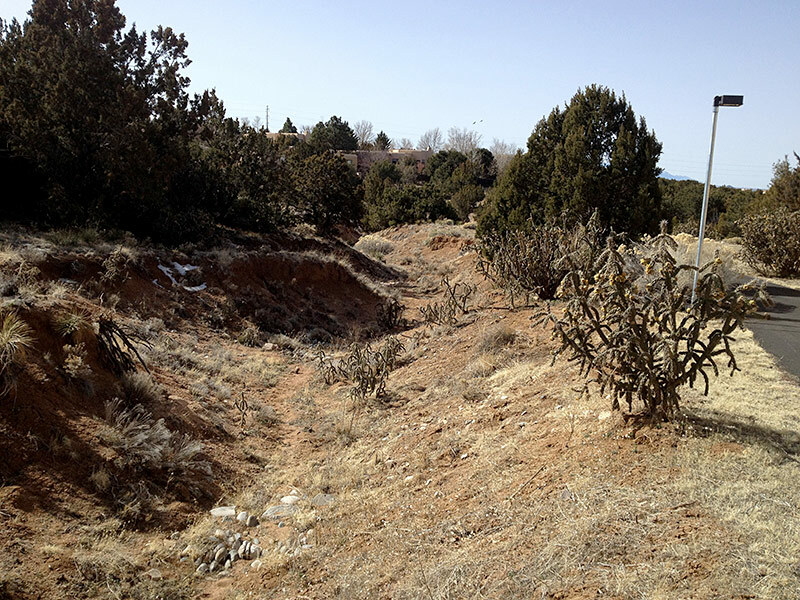 Erosion frequently goes unchecked here in the Southwest, but with minimal techniques to help sediment deposition, we can re-establish vegetation. Vegetation is what we need to hold our soils in place, and bring the land back to a healthier state. 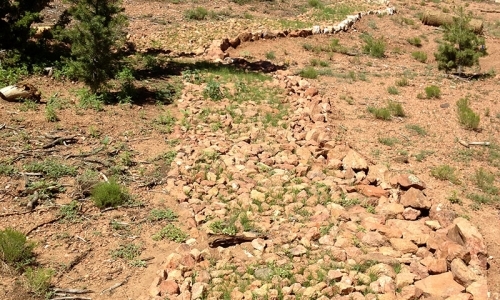 Erosion control can incorporate a number of solutions to keep erosion in check. 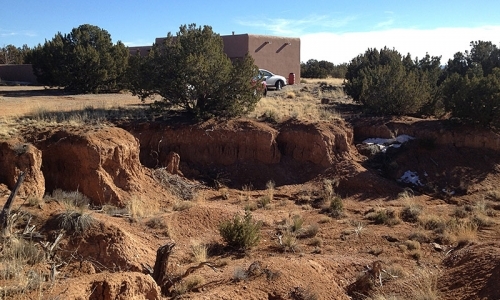 Why should I be concerned about erosion? The long term effects of erosion are fairly devastating, including the loss of trees and landscape, loss of real property, depletion of groundwater, minimal groundwater recharge, sediment deposition in larger water systems, loss of property value, flooding damage, loss of wildlife habitat and loss of biodiversity. 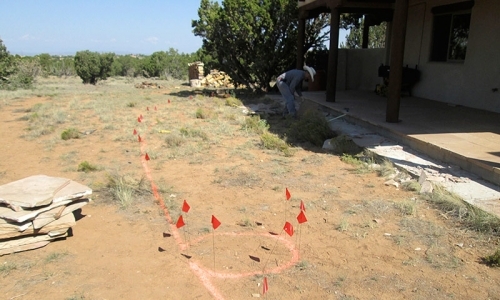 How can I inspect my property to check for erosion? Simple things to look for on your own property: Watch where water moves on site, where does it pick up speed and energy? Where does it soak in? What can you notice about where it concentrates flow? Are there small rivulets forming anywhere? Do you see roots of trees sticking out of the ground? If you see any of these things, installation of the various water collecting structures you can review here are helpful (swales, berms, terraces, one rock dams, etc.) paying attention to water flow will help you decide what needs to be done. Remember: always start at the top of the water shed! 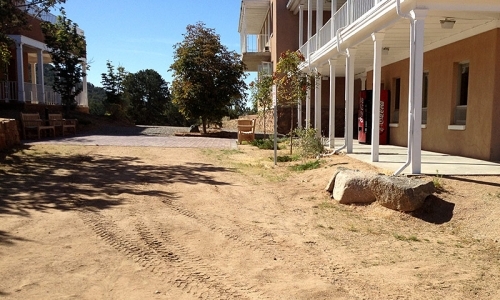 Why is erosion control important for my property? 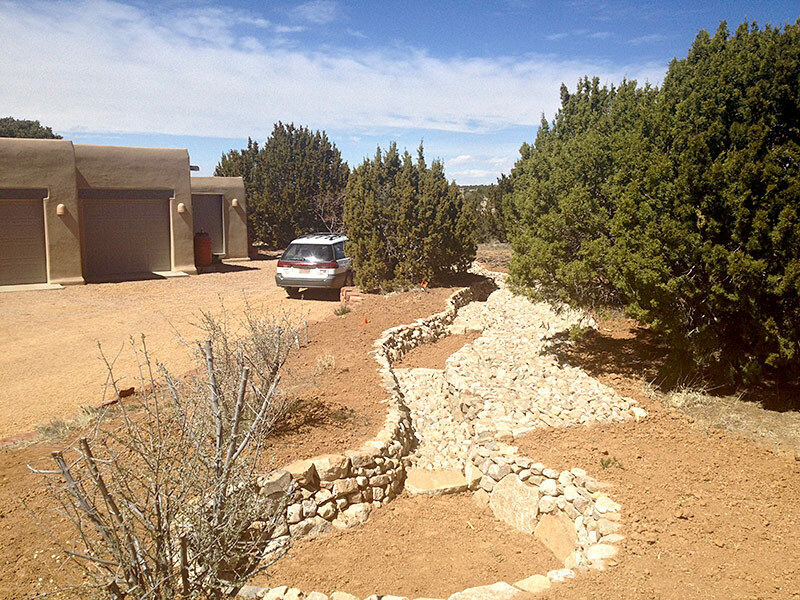 Erosion control is generally needed on larger sites, but even in smaller yards, runoff water from neighbors’ properties can be a nuisance. But don’t forget the permaculture principle: the problem is the solution! 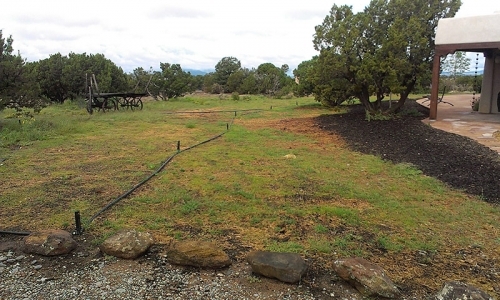 Now you have all that extra water to put to use in your yard with the proper design. 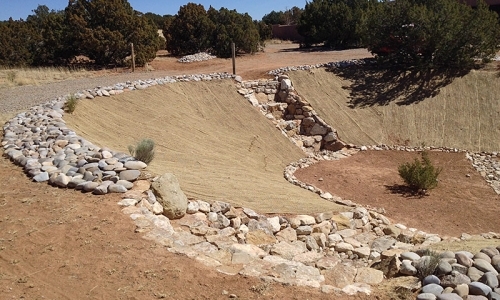 Establishing native grasses and plants, and channeling water with rock structures helps eliminate the damaging effects of unchecked erosion. 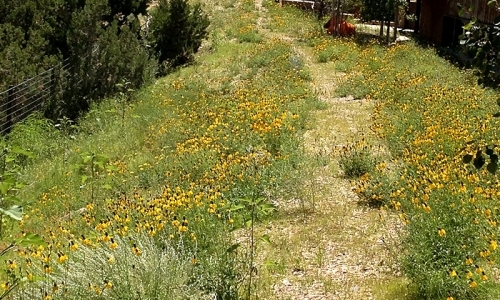 What is ground cover, and why is it necessary? 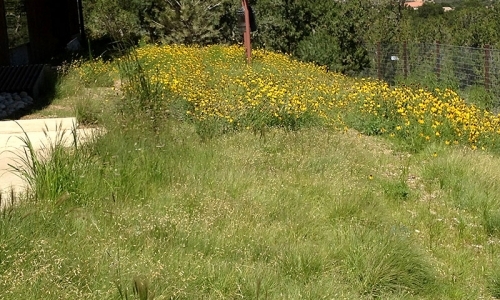 Ground covers are low-growing plants that spread quickly to form a dense cover. 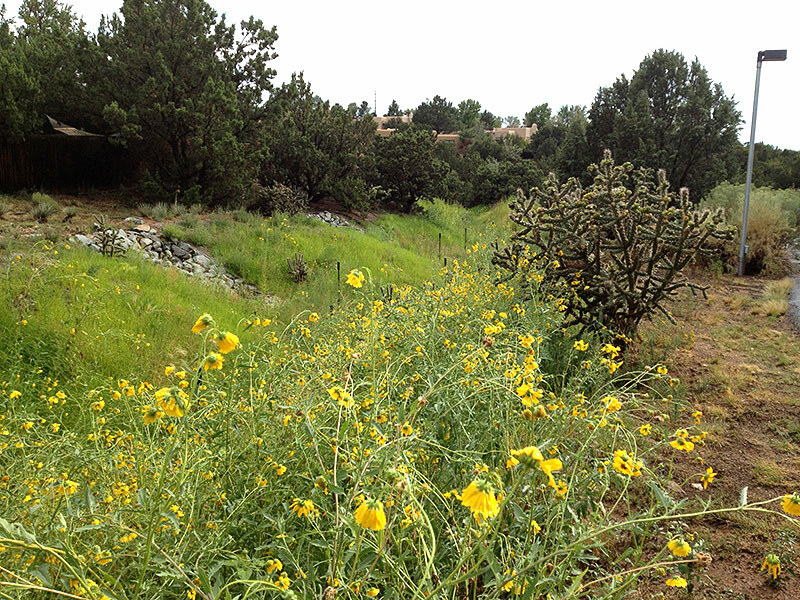 They add beauty to the landscape and, at the same time, their root systems help prevent soil erosion. 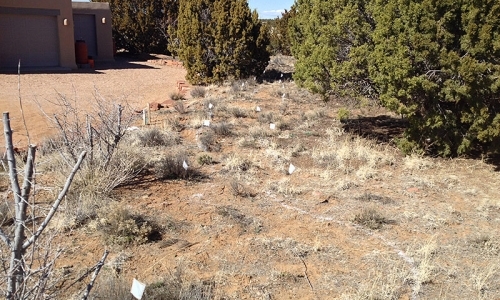 Ground cover is what we need to hold our soils in place and bring the land back to a healthier state. 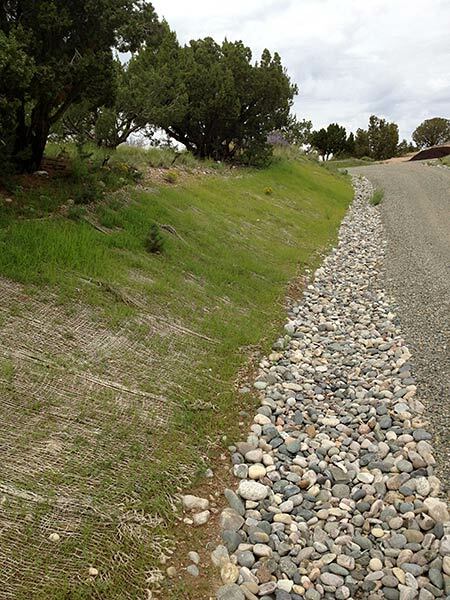 What are some strategies used for erosion control? 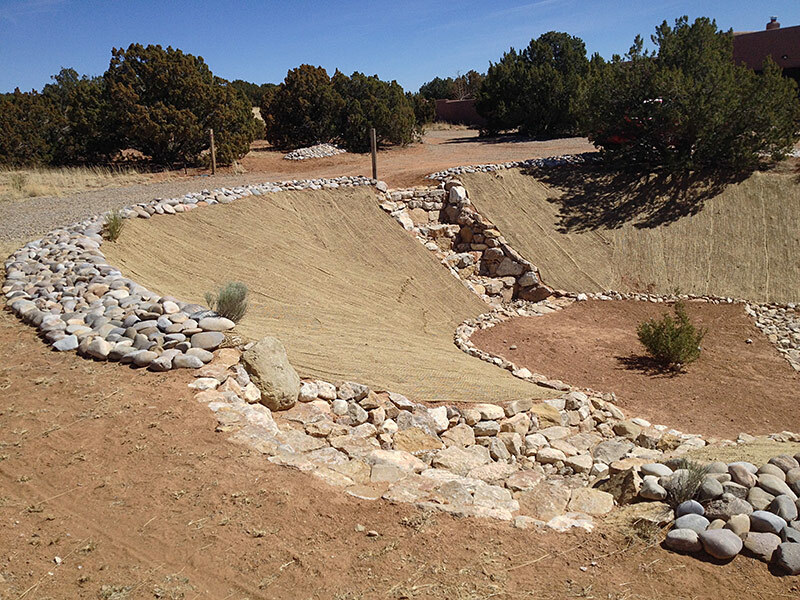 The main strategy for erosion control is to think about it as water harvesting and strategic channeling. The more we spread out the water, slow it down, and let it infiltrate the better. This way the water is cured of it’s excessive energy where it picks up speed and sediment and moves it downstream forming rivulets, gullies and arroyos. Sediment control is crucial, because capturing sediment can create a nice soil base to grow plants, and roots will hold the soil better than anything. Ground water is the water that makes it through the first layer of soil and is stored in the ground where it is usable by plants. 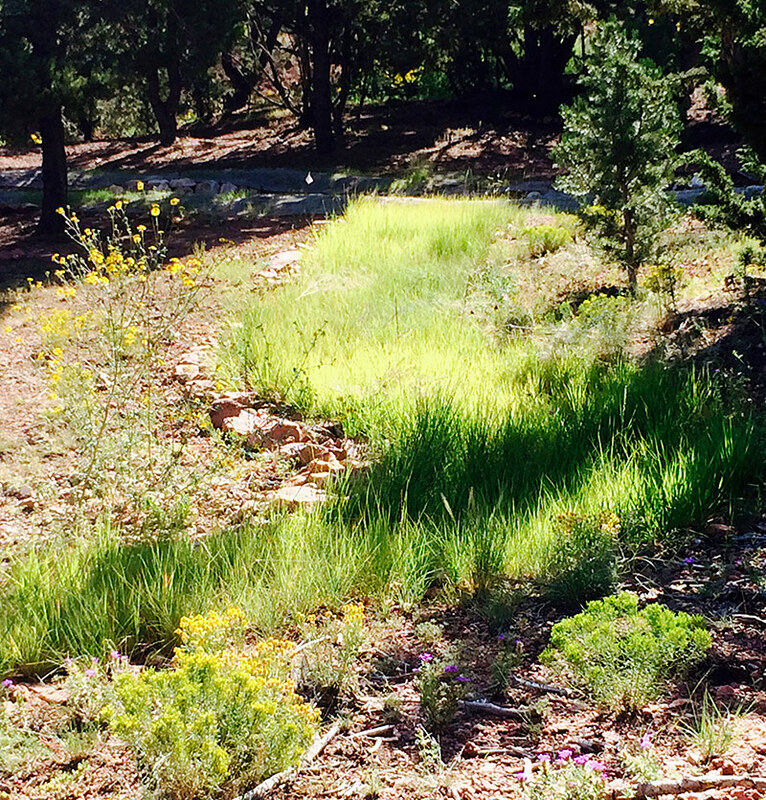 Trees, shrubs and native grasses can access water up to 30’ down in the soil, and any water that we can store in the ground will either help grow plants, or will make it to a low point where it can exit the ground via an ephemeral stream. 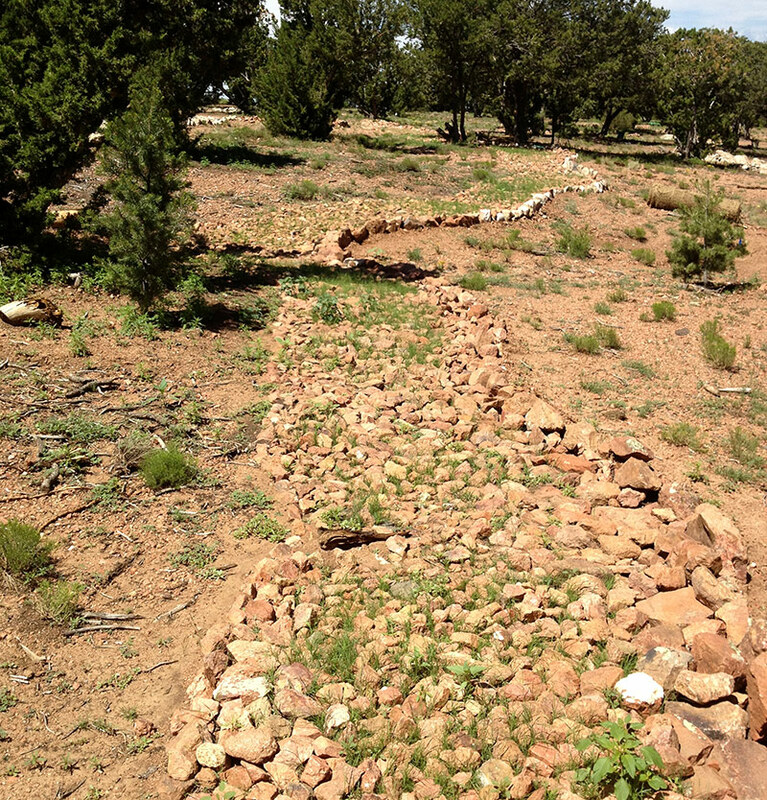 Does erosion hurt native ecosystems? 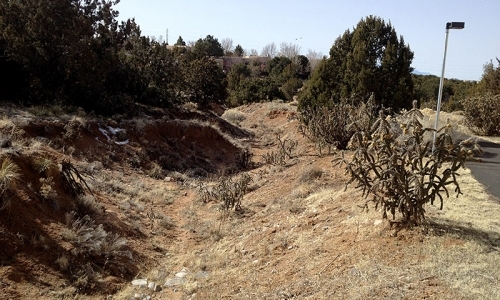 Erosion is a natural process, but in the desert it is amplified because of our minimal soil/vegetative cover. Erosion can happen quickly and drop the water table of native ecosystems rather quickly (10-30 years can prove to be fairly drastic). The slower and wider water moves through an ecosystem, the more water that is taken up by the soil, which means more plants can grow, which means more wildlife habitat and healthy soils. 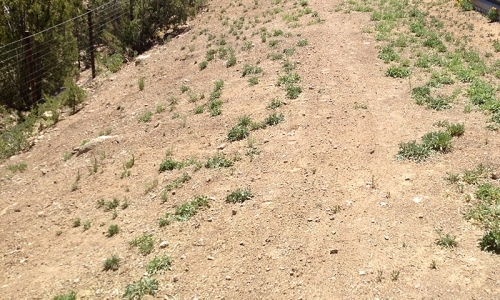 Before: Destructive erosion will continue towards this house & driveway. 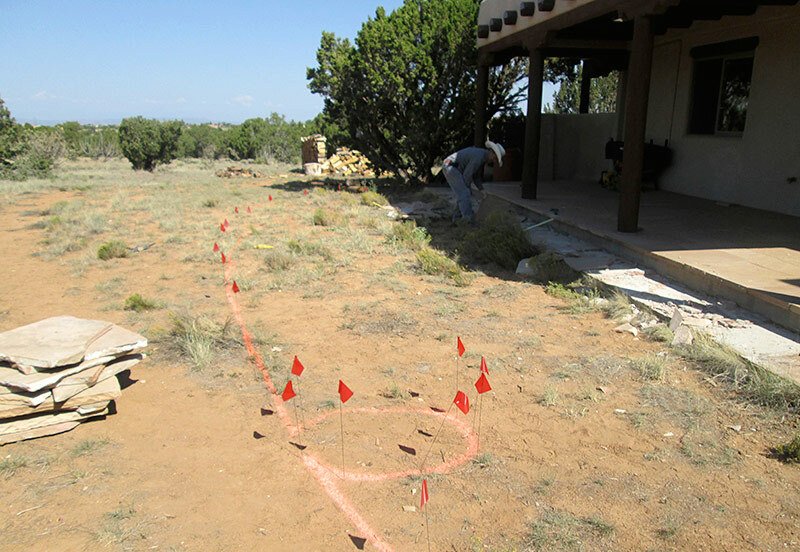 After: Water is now guided through drop structures & zuni bowls. 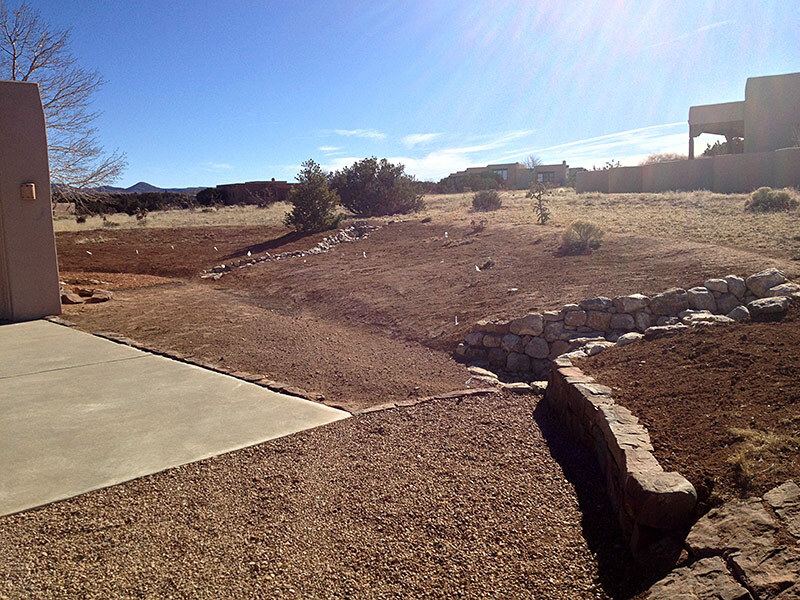 Before: Typical drainage with steep banks & side channel erosion. 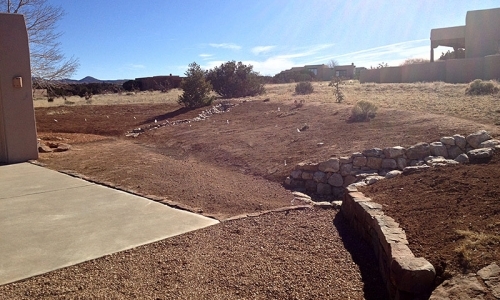 After: Steep banks gone; zuni bowls & native grasses/wildflowers added. 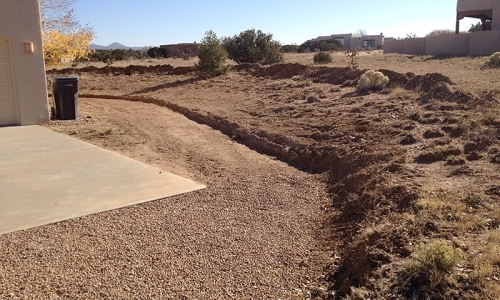 Before: Drainage from a neighbor's property can cause unexpected erosion. 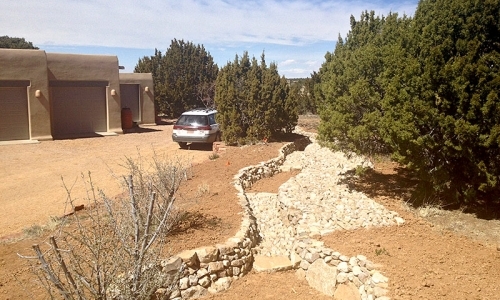 After: Water is now channeled into planting areas around the home. 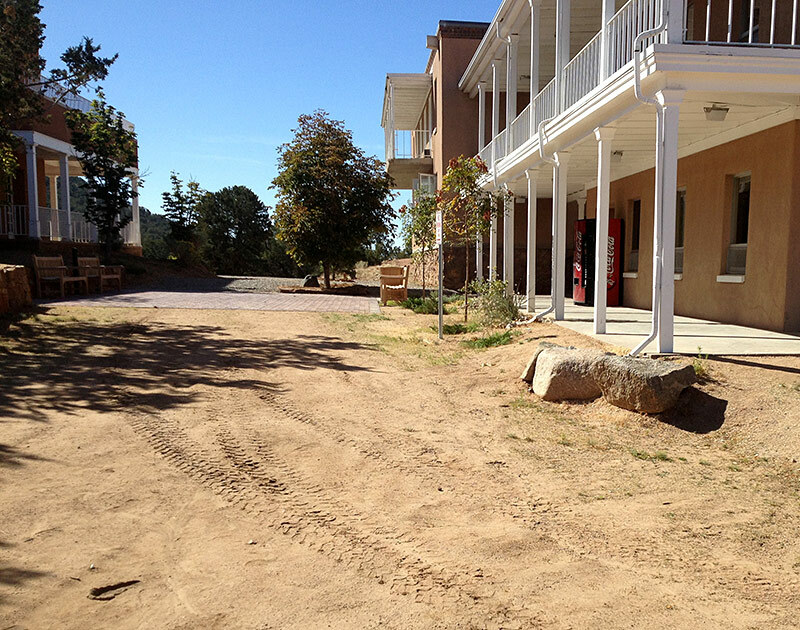 Before: Roads & parking lots concentrate runoff water, creating erosion. 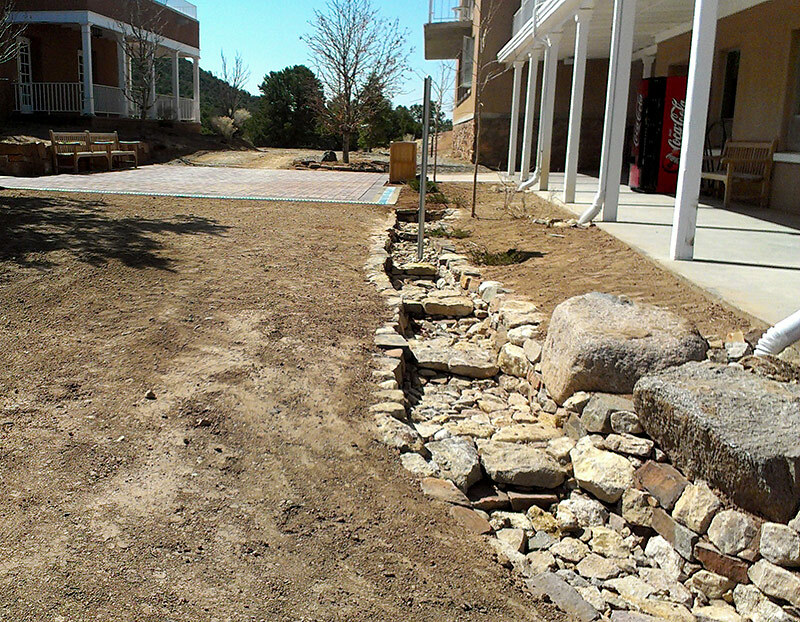 After: Using slope, runoff now flows into channels to water the landscape. 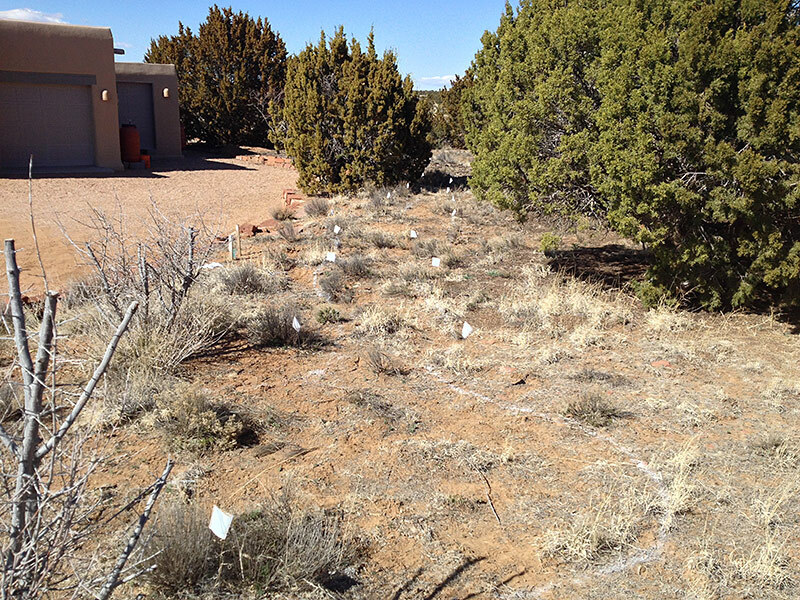 Before: Compacted native soil, with low nutrient content: dry & barren. 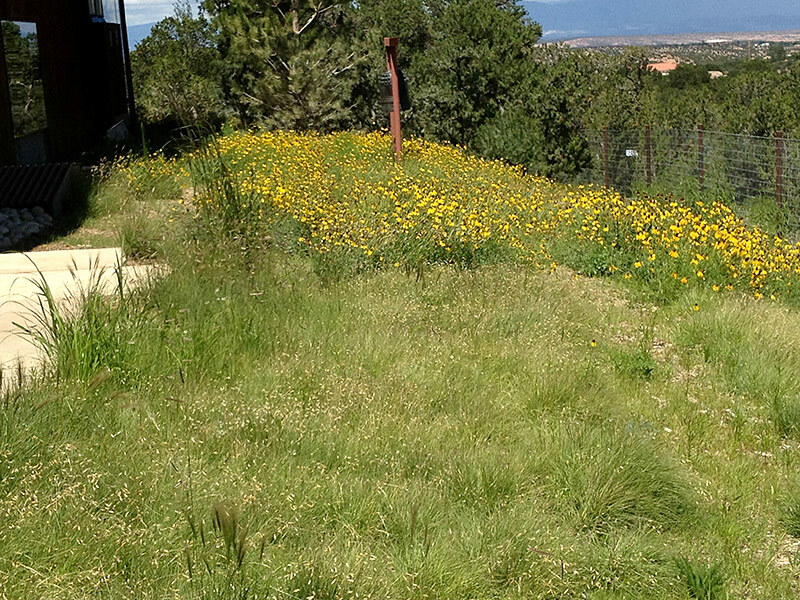 After: Native grasses/wildflowers, organic matter, beneficial microbes add life. 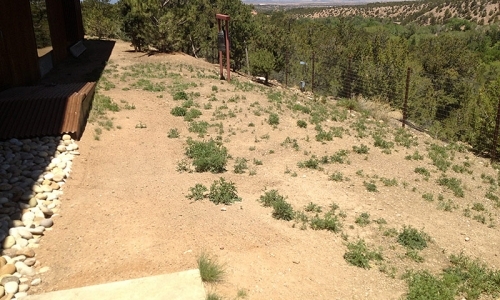 Before: Dry, stark landscape with no vegetation is constantly being eroded. 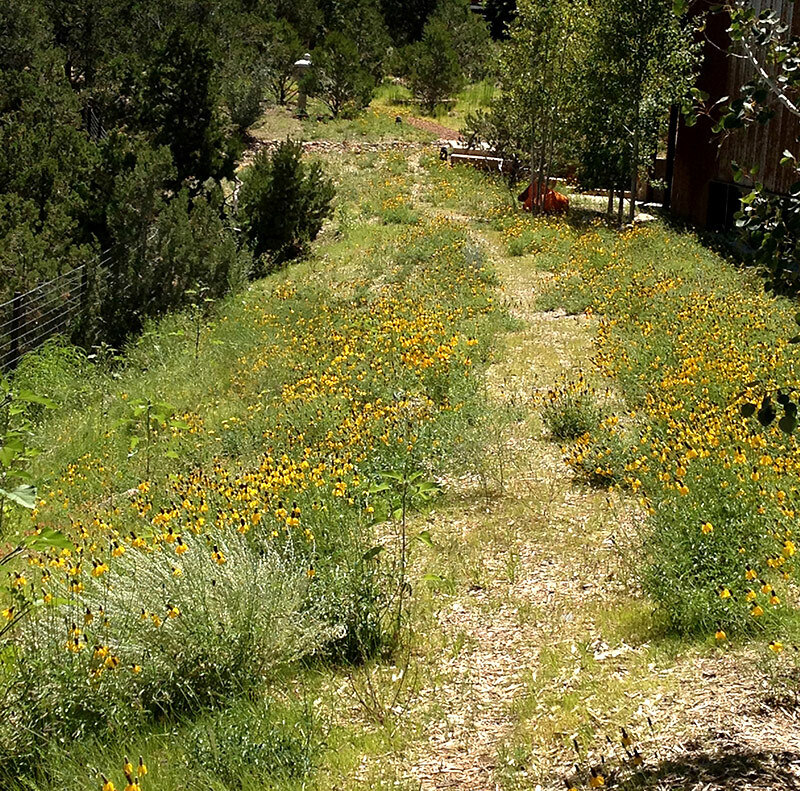 After: Temporary irrigation helps native grasses & wildflowers establish. 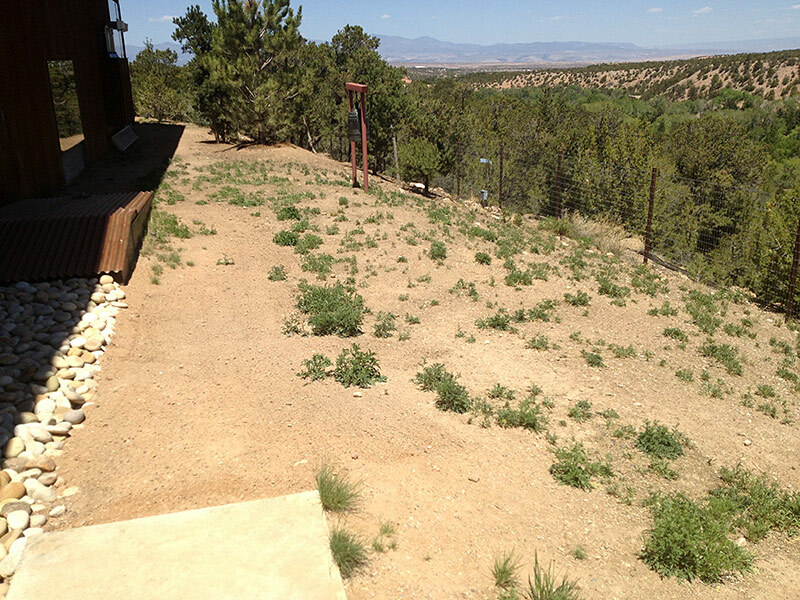 Before: Barren slope with erosion decreases property value & aesthetics. 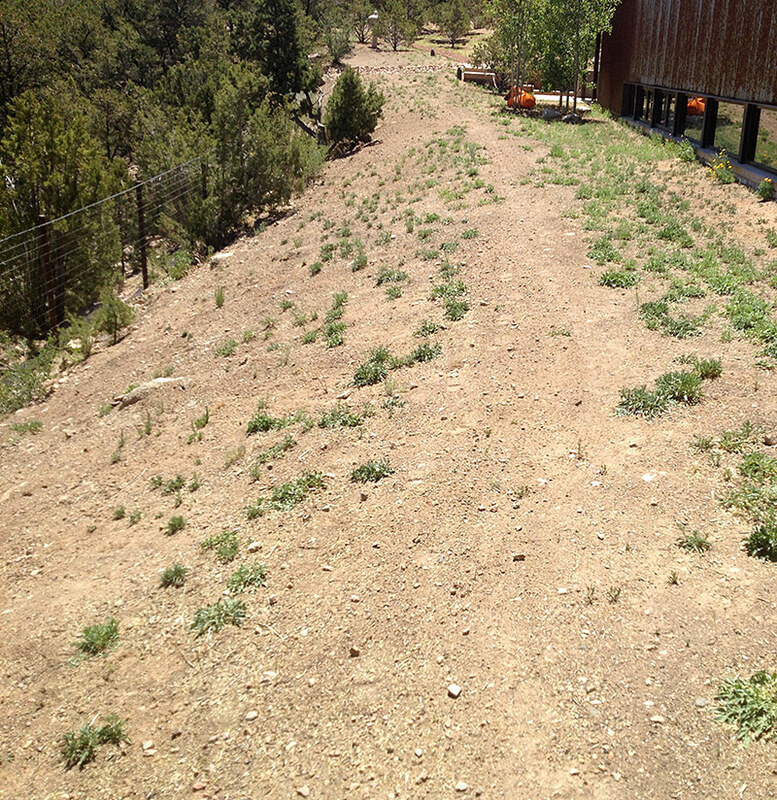 After: Grasses & wildflowers are planted to eliminate erosion. 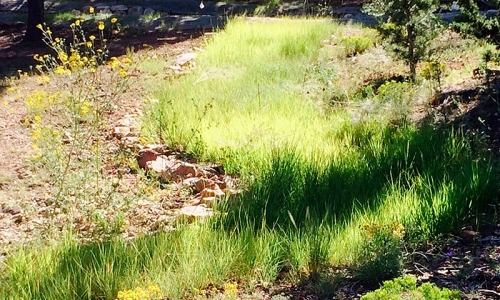 Before: 'One rock dam' with native grass planted under rocks, deters erosion. 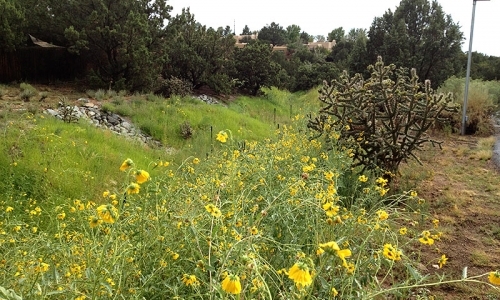 After: One year later, native grass spreads thanks to passive water harvesting. 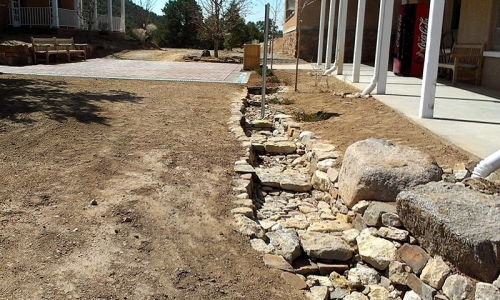 Before: Runoff water from an adjacent property flooded this area yearly. 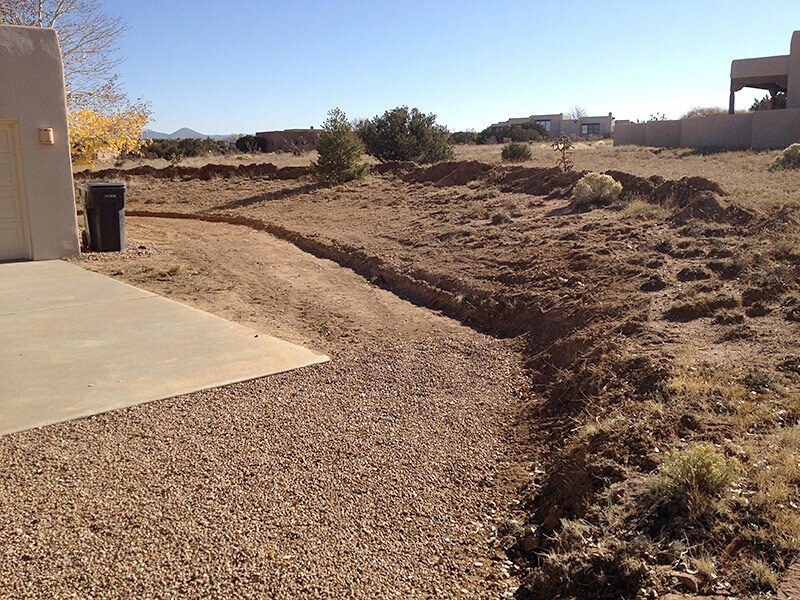 After: New drainage reroutes water to an orchard behind garage.